Introduction:	Rhinoscleroma, a rare nasal granulomatous disease, is caused by Klebsiella rhinoscleromatis. The nose is the primary occurrence region. Nasal non-Hodgkin lymphoma is a rare cancer, and could be of T or B type. The rhinoscleroma and the nasal non-Hodgkin lymphoma present with nasal obstruction as the main symptom, and are part of the nasal granulomatosis differential diagnosis. Objective:	To report the association of rhinoscleroma and non-Hodgkin lymphoma in the same patient, by remarking the importance of the nasal granulomatosis' differential diagnosis. Case Report: A forty-nine year old female patient that appeared with a one-month progressive nasal obstruction. Rhinoscopy showed papillomatous feature lesion in left middle meatus. The immunohistochemical analysis confirmed rhinoscleroma. The patient was duly treated with total remission of the lesion. Ten months after, she returned with the same symptoms, but the histologic study confirmed non-Hodgkin lymphoma. Final Comments:	Both pathologies may cause more severe nasal symptoms and complications. The early diagnostic enables the choice for the right treatment and contributes for the prognosis. The immunohistochemical study was essential for the diagnostic differentiation. Rhinoscleroma, a rare nasal granulomatous disease, is caused by Klebsiella rhinoscleromatis. The nose is the occurrence primary region (1), and it may reach the palate, larynx and lung (2). The histological exam enables the identification of Mickulicz's cells, which are macrophages that turned gram-negative bacillus into phagocytes, and they represent a classical finding (1). The nasal non-Hodgkin lymphoma is a malignant neoplasm and may be of type T or B when it affects the nasal region. The treatment is made by means of radiotherapy and, depending on the invasion and staging, it may associate with chemotherapy. The nasal obstruction is the main symptom of rhinoscleroma and nasal non-Hodgkin lymphoma (2,3), and they are part of the nasal granulomatoses' differential diagnosis. The diagnosis is suggested by the anatomopathological exam and confirmed by the immunohistochemical study (2). The association of these two pathologies in the same patient is herein reported. 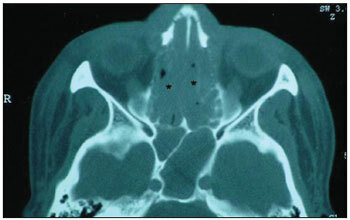 M.C.T, a female patient, aged 49 years old, white, assisted by the otorhinolaryngology service, presented with a one-year progressive nasal obstruction. The rhinoscopy evidenced papillomatous lesion in the left middle meatus, crusts and purulent secretions without necrosis. The computerized tomography showed ethmoidal sinus mucous thickening and tumoration which suggest polyps in the left middle meatus and nasal cavity. The middle meatus lesion anatomopathological study suggested non-Hodgkin lymphoma. However, after immunohistochemical study, the lymphoma markers were negative and the marker for rhinoscleroma, histiocyte CD 68, was positive. We immediately chose the treatment for rhinoscleroma with the use of sulphamethoxazole-trimethoprim. After four months, there was an expressive regression of the lesion and mucous atrophy and crusts remained. After eight months of antibiotic therapy treatment, the computerized tomography was compatible with chronic rhinosinusitis. The patient was asymptomatic and the rhinoscopy was normal. After suspension of the antibiotic therapy, the patient was considered to be cured of rhinoscleroma. After ten months of the initial picture, two months after the treatment suspension, the patient presented with the same symptoms and a lesion in the left middle meatus. The antibiotic was reintroduced and another anatomopathological study was requested. However, after three days, there was an aggressive increase of the lesion with nasal pyramid diffuse convexity, necrosis, bilateral, malar bow and lips periorbital edema (Picture 1). The computerized tomography revealed the filling of all paranasal sinuses and nasal cavity by soft parts tissue (Pictures 2 and 3). The anatomopathological study suggested non-Hodgkin lymphoma, with several necrotic areas. Then the immunohistochemical study was carried out with positive results for markers of non-Hodgkin lymphoma CD45RO (cells T). The patient was, then, submitted to radiotherapy and combination chemotherapy (cyclophosphamide, vincristine, prednisone) and the tumor recurrence signals didn't remain for approximately four years (Picture 4). Picture 1. Patient upon diagnosis of nasal non-Hodgkin lymphoma, showing nasal pyramid affection and facial edema. Picture 2. Computerized tomography showing nasal cavity and paranasal sinuses filling (asterisks) with soft parts density material. Picture 3. Computerized tomography showing nasal cavity filling (asterisks) with soft parts density material. Picture 4. 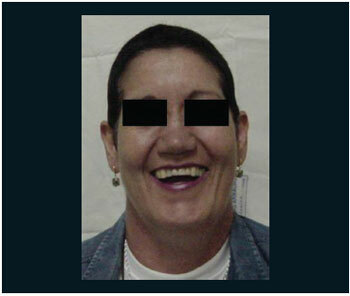 Patient after radiotherapy and chemotherapy treatment. The rhinoscleroma is a rare granulomatous disease, whose diagnosis is based on the bacterioscopy, culture, anatomopathological, immunohistochemical (2,4) and immunoperoxidase studies in dubious cases. As well as with the non-Hodgkin lymphoma, both must be excluded faced with an uncertain nasal lesion. The difficulty of the differential diagnosis between nasal lymphoma and rhinoscleroma, upon histopathological exam, was described in children. Such difficulty occurred in the case of this patient, and there is the need to carry out the immunohistochemical exam for elucidation. 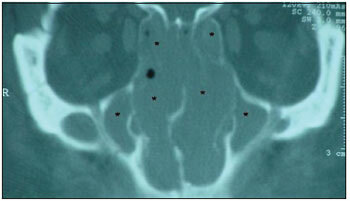 The occurrence of rhinoscleroma associated with other diseases has already been described. Sehani et al (1998) described two cases of nasal tumor expanding to paranasal sinuses, which suggested rhinosporidiosis, and the anatomopathological exam revealed rhinoscleroma (Mikulicz's cells) and rhinosporidiosis (sporangium) (6). The nasal non-Hodgkin lymphoma corresponds to 0.17-2% of the non-Hodgkin lymphomas (3). Two factors are important for the diagnosis: the disease stage and the paranasal extension (3). The nasal lymphoma of histologic type T has a worse prognosis than those of B. The patient presented with non-Hodgkin lymphoma of cells T with paranasal extension, a more aggressive type with fast evolution. The type T/NK tumors, called angiocentric, presented vascular invasion and a high degree of necrosis, and suggested that in the first moment the patient didn't present with lymphoma, since the necrosis was only observed ten months after, in the second lesion. The rhinoscleroma and the nasal non-Hodgkin lymphoma are rare, and the early diagnosis is crucial. The initial accomplishment of anatomopathological and immunohistochemical studies directed the correct treatment in both cases with the certainty that they were to associated entities and not the recurrence of the same one. The patient was submitted to anatomopathological and immunohistochemical exams, which enabled the early diagnosis, the suitable treatment and the favorable prognosis, and the importance of the immunohistochemical study in the differential diagnosis was emphasized. In this case, the diseases were not synchronous, because the first exam was not conclusive for nasal lymphoma and the time elapsed between the lesion remission and the new picture was long enough to consider the coexistence of lymphoma in the initial rhinoscleroma. The patient presented with the diagnosis of non-Hodgkin lymphoma of cells T with paranasal extension, the most aggressive type and with fast evolution. Therefore, it's unlikely that she would have presented this disease upon the first diagnosis. The lesion resulting form rhinoscleroma disappeared with antibiotics and the patient remained well for ten months. After this, she died for the lymphoma recurrence, approximately four years after radiotherapy and chemotherapy. In the literature there are no reports of lymphoma that has disappeared or remitted after antibiotic therapy. 1. Graduation in Medicine/UFMG. Resident Doctor in Otorhinolaryngology. 2. Master's Degree in Molecular Pathology - Immunology at the University of Brasília. Preceptor Otorhinolaryngologist of the Medical Residence Program of the Armed Forces Hospital. 3. Graduation in Medicine. Otorhinolaryngologist. 4. Graduation in Medicine/UnB. Resident Doctor in Otorhinolaryngology. 5. Graduation in Medicine/UFMS. Resident Doctor in Otorhinolaryngology. Institution: Hospital das Forças Armadas - Serviço de Otorrinolaringologia e Cirurgia de Cabeça e Pescoço. Brasília - DF / Brazil. Article received on January 02, 2008.